Hosting a party and all the chairs appear to be occupied? Time to bring out the Jess Duckegg Blue Stripe Garden Cushion to solve your seating issues. Or add to those hard uncomfortable garden seats and benches to make life a bit softer. This gorgeous floor cushion is different from others you’ll find on the High Street as its plush padding makes any occasion comfortable, relaxed and stylish. 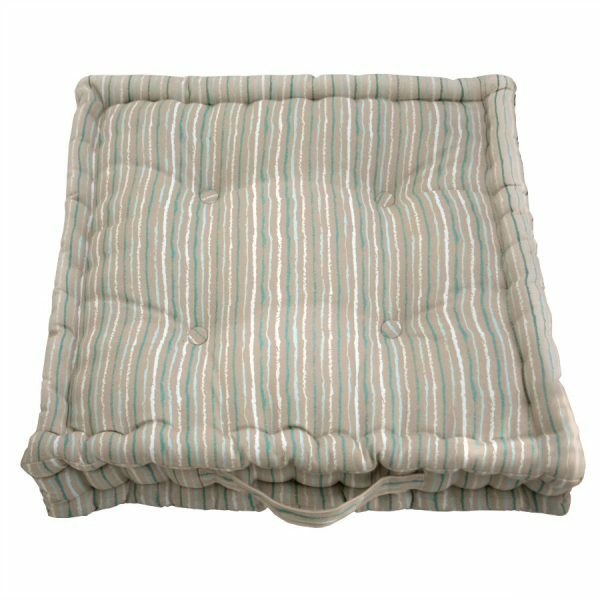 Our Jess Floor Cushion features a stunning print of duck egg blue and white ragged stripes on a neutral taupe background. It’s guaranteed to co-ordinate well with any home decor. The fabric is 100% cotton and decorative buttons help finish the look of the cushion, contrasting well with the beautiful stripy pattern. 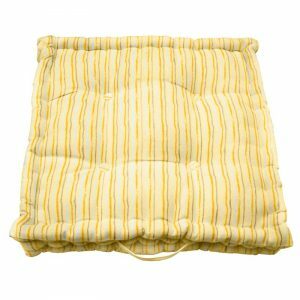 The Jess Floor Cushion Duck Egg Stripe is so practical, it even comes with its own carry handle so it’s easy to move from place to place. It’s suitable for any occasion whether it’s indoors or outside and is perfect for the beach, patio or garden. This stunning Jess Floor Cushion Duck Egg Stripe can be cleaned either by hand wash or use a wool wash cycle low temp and very slow spin so as not to distort the inner filling and dry flat. We advise that you wash this cushion cover with other items of a similar colour so you don’t ruin the pretty print. Please note that this garden cushion is not waterproof but if caught in a shower it will quickly dry out in the sun. Duck Egg Blue has always been a favourite colourway with our customers which is why we have a variety of matching items available. Choose from our Tracy Tea Towels, beautiful Bessie Oven Gloves, Peggy Peg Bag, Betty Frilly Apron or Billy PVC Garden Apron. We also have a beautiful range of bags available including our Tasha Tote Bags, Harriet Wash Bags, Vanessa Vanity Bags or Trudy Trug Bags. Well made, versatile & beautiful fabric. Thank you so much for your kind comments .We do hope you shop again soon with us and watch out for our special offers we will send .